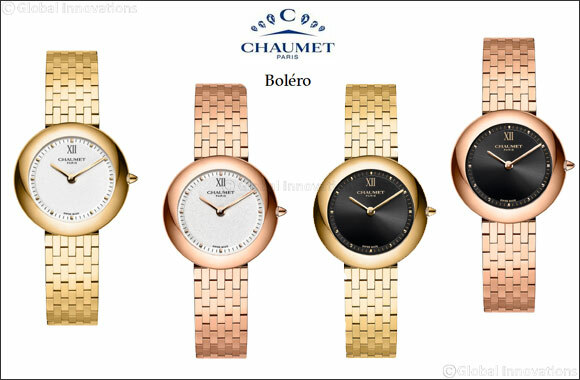 March 31, 2019: Possessing the suppleness of a dance movement and the captivating harmony of a classic, Boléro is the new watch for women from Chaumet. In elegant and sensual gold, it is the marker of women who choose distinction. Its assertive design appeals to remarkable women. Photographer Matthew Brookes captured the special aura of the women who chose Boléro as the signature watch for their look. Whether an internationally acclaimed actress, a virtuoso pianist, a primera ballerina, interior designer or airline pilot, all capably assuming strong career choices, in Boléro these women of today have found a watch that represents who they are. Inspired by emblematic watches from Chaumet’s history, with its discreetly sophisticated design Boléro captures the Maison’s characteristic mastery of line. With a circular bezel, sweeping profile, and pared-down dial, the sense of purity is extended by the bracelet in gold mesh, its second-skin softness, suppleness and lightness expressing the signature Chaumet savoir- faire. This jewellery delicacy is found in every detail, such as the sculptural crown, or the clasp conceived in the manner of a jewel, polished like a mirror and perfectly marrying the curve of the bracelet. Boléro is available in yellow and pink gold, as a large model with a Swiss automatic movement or a small model with a Swiss quartz movement. Its dial exists in sober white or a more visually arresting graphic black. The singular universe exemplified by this precious timepiece is further explored through a jewellery collection in yellow or pink gold, to be worn as desire and occasion suggest. In variations on the gold mesh theme, the bracelets feature a clasp recalling that of the watch, while the supple rings express the simplicity of gold in the small model, and the elegance of diamonds in the larger version.